Sylvia Ganier’s surprise registered higher than anyone’s when over 500 people showed up to buy produce at her little farm the first day it opened to the public just outside Nashville, Tennessee. Then she decided to see if anyone might be interested in buying some produce. In five years, her business, Green Door Gourmet, grew to include a busy well-stocked on-farm market, an event center, CSA programs, a chef, school tours, and just about anything else a farm can do these days. “The epiphany was the hunger for local food. The time was right for our farm business to get going,” she says. Food passion. Food had always been her passion. She grew up on a North Carolina dairy farm and worked in Nashville restaurants for many years, including owning the popular Cibo Cafe and Catering. When the building where it was located sold to a hotel chain, engaging with organic gardening seemed a natural pursuit for her. She just didn’t know it would grow into a business of any kind, particularly one this large. Her business background helped, of course. So did her childhood on the dairy farm. “I had a lot of responsibility on the farm in a lot of different areas. I was the youngest of five children. The set of skills I gathered was great and it’s helped me throughout my life. We milked the cows with two sets of electric milkers. But if the power was out, we milked by hand. I dealt with the calves, feeding them, cleaning out their barn,” she says. The farm produces more than 80 fruits and vegetables, along with at least 80 different flower varieties, and a couple of dozen herbs. That diversity gives customers lots of choice. “We employ a chef here. On Saturdays he shows people how to use the different products. You’d be surprised how many people don’t know how to use them. He sets up a tasting table. We also have recipes online,” she says. 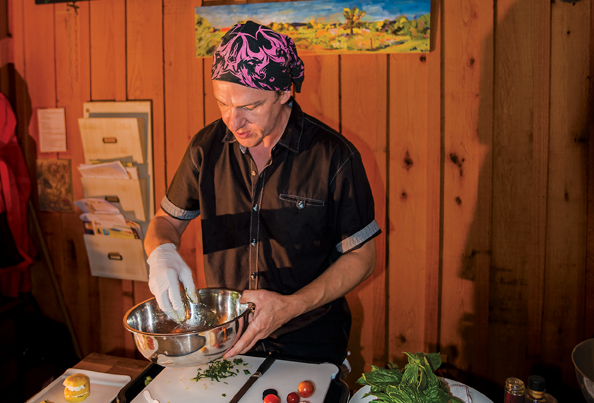 “Every year we do a challenge that’s Chef Richard versus a CSA box. He doesn’t know ahead of time what’s in the box but has to use everything in it within an hour. It’s a lot of fun, and all about how to become comfortable with the ingredients in the kitchen. Stop in the farm’s 2,000 square foot market and you’ll be reminded of an old-time country store. 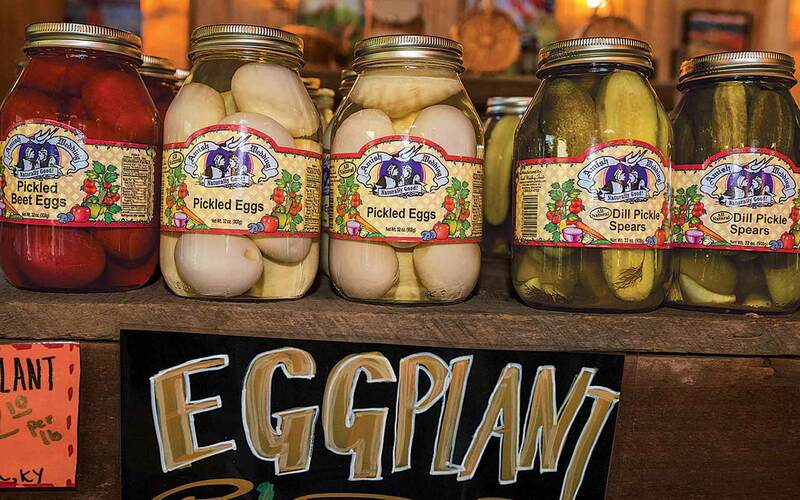 It carries produce, fruit, eggs, honey, meat, and other products from more than 100 area farmers and companies, adding to the diversity that this farm offers its customers. “We’re reaching out to get folks that may not make it to farmers markets. And we have lots of opportunities for farmers we approve to bring product into the store. We have lamb that’s as good as any you can get in Europe. We have fantastic eggs with a deep orange yolk. I love being able to help farmers who don’t have the access to participate in other markets. The question is, how do we make an impact in the community? We want to be an incubator of creative ideas for the community,” Ganier says. Chef Richard Jones works to expand customers’ food expertise, often with more unusual items like kohlrabi, eggplant, or hakuri turnips. Flexibility. That kind of thinking carries over to the farm’s Community Supported Agriculture (CSA) programs. Realizing that everyone doesn’t want the same products and that some people prefer to start small, Ganier began Local Farm Box, a flexible program that lets customers pack their own box on weekends for $27. The farm also offers a conventional CSA program with a 22-week commitment of $550 for the 2016 season. “Eighty percent of our food is local. Fifteen percent is regional. Five percent is international because we sell coffee. We want local food and to bring in culinary components. The world we live in enables us to think globally. I don’t believe that’s bad. I believe in buying locally and thinking globally. We buy local June apples and have learned to appreciate their taste and flavor. But when none are available, that’s when thinking on the bigger scale comes into play,” she says. Educating customers rates high on the farm’s scale of importance, too. “We have an illusion in this country that nothing can have a wrinkle, a spot or blemish, that everything has to be the exact correct color. Then that product is wasted and 40% of our food goes right into landfills. But it’s good, usable, healthy food. I say, look for the worm in the ear of corn. That’s how you know it’s organic. If it tastes good to the worm, its probably going to taste really good to me,” she says. Busy place. With its 22 employees, many regular customers in the market, school groups touring the farm, weddings, receptions, farm-to-table dinners and charity benefit shows in the 6,000 square foot event center, Green Door Gourmet nearly always hops with activity of some sort. Plus, Ganier keeps adding projects. New for this year: a pick-your-own strawberry operation with 100,000 plants. “We are a hodgepodge of different things but we think it’s important to be diverse and to educate people about the food they eat,” she says. A big part of that involves using good farming practices. The 350-acre farm along the Cumberland River west of Nashville includes 158 acres of certified organic fields. All crops are rotated on a regular basis. Cover crops include buckwheat, clover, turnips and dikon radishes. Climate change may tip the scales for wheat, weeds, and diseases.